The Passing Tramp: "That Mysterious Individual Mrs. Victor Rickard": Jessie Louisa Rickard (1876-1963), Crime Writer? "That Mysterious Individual Mrs. Victor Rickard": Jessie Louisa Rickard (1876-1963), Crime Writer? As editor of the collection, Street was tasked with trying to track down all of the current Detection Club members (nearly forty people), seeking from them contributions to the, erm, ditty-bag. Street had particular trouble locating several members, including the person he dryly termed "that mysterious individual Mrs. Victor Rickard." 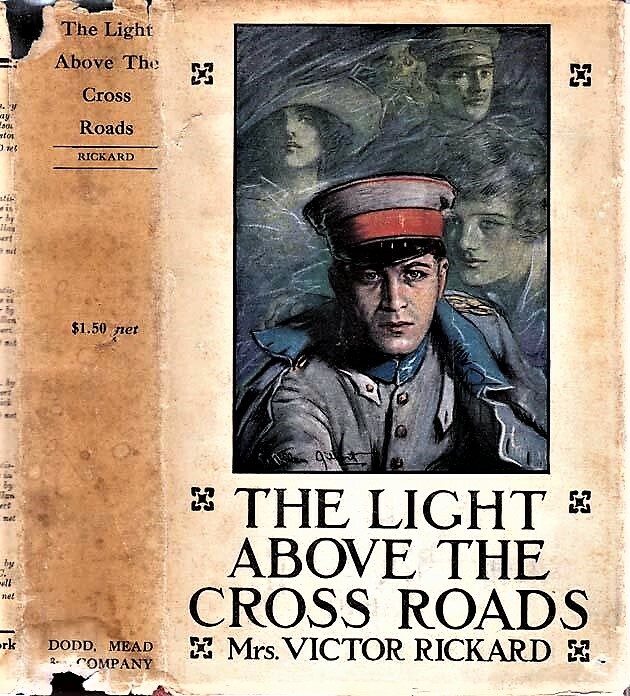 Just as Mrs. Rickard was to her fellow Detection Club members in the 1930s, she has remained an elusive presence today within the mystery fiction genre, being far better known for her marriage to Victor Rickard and her Great War fiction than for her crime writing. 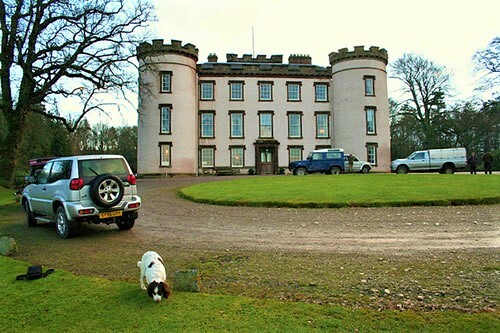 Hatton Castle was in the news recently when the Duff family put it up for sale after over three centuries of ownership. Some news sources pointedly noted at the time that the family was deeply displeased with the actions of the SNP, or Scottish National Party. Courtenay Moore was, notes John Hayes (in "C. S. Lewis and a Chronicle of the Moores," Irish University Review, 2009), a progressive man for his time in some ways, advocating "change in respect to Irish land tenure...Home Rule, and the fostering of Gaelic, in public lectures and articles." The youngest of Courtenay and Jessie Moore's children, Louie Moore had two brothers and a sister (another sister died in infancy), the brothers being Alexander Duff Moore, future Archdeacon of Glendalough, and Courtenay Edward Moore, a civil engineer who married Jane ("Janie") King Askins, daughter of Reverend Canon William James Askins. Before their separation in 1907 Edward Moore and his wife Janie had two children, Edward ("Paddy") Francis Courtenay Moore and Maureen ("Daisy") Helen Moore. Paddy Moore was a roommate of author and theologian C. S. Lewis during the pair's wartime army training at Keble College, Oxford; and at the altogether too young age of 19 he was killed in France during the last year of the Great War. After the war Lewis lived with Paddy's mother Janie Moore (many Lewis authorities believe Lewis had a sexual relationship with the more than two decades older Janie, who never returned to her husband, Louie Moore's brother, whom she bluntly dubbed as "The Beast") and her daughter, Daisy, a future baronetess (one of only four in British history) through her Duff family lineage. 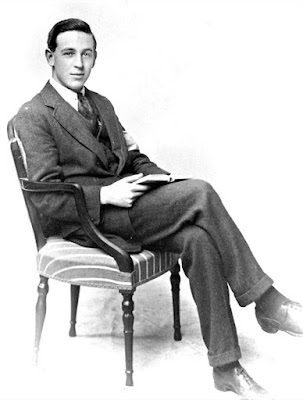 C. S Lewis, it has been pointed out by scholar John Hayes, shared a markedly similar personal background to the Moores: the Lewises and Moores, he notes, "were Irish, Anglican, markedly clerical, and literary." Let's move on to the most literary Moore, Jessie Louisa Moore, future crime writer. In 1901 Louie Moore married Robert Dudley Innes Ackland, but the couple divorced in 1907 (provoking a rift with her father), after Jessie had given birth to a daughter. A lieutenant in the King's Liverpool Regiment in September 1914, Ackland was dismissed, for reasons unknown to me, from the service the next month, rejoining the army as a private in the Royal Welsh Fusiliers. Whatever his personal faults, he gave his life for his country, becoming one of the last soldiers killed in action at Gallipoli in 1916. Louie Moore next wed Lieutenant-Colonel Victor George Howard Rickard in 1908 and the couple had a son together. He too would die in action in the First World War, in France in 1915. Louie married one more time, this time to Tudor Fitzjohn, whom she divorced. In contrast with Louie's first two husbands, he survived the Great War, in which he fought valiantly, passing away a year before Louie at the age of 87. 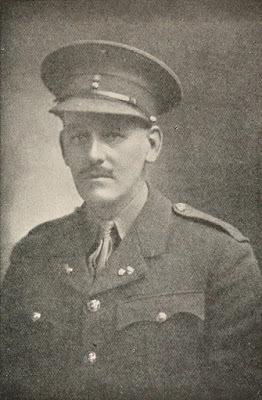 At his death on May 9, 1915 at the Battle of Aubers Ridge, characterized as an "unmitigated disaster for the British" (in part because of the poor condition of British artillery and ammunition, a fact which precipitated the so-called Shell Crisis of 1915), Lt-Col Victor Rickard was leading an advance out of the trenches by the 2nd Battalion of the Royal Munster Fusiliers, which he had commanded since February 6. Fifteen paces from the British lines he was killed instantly by a bullet to the spinal column in his neck. Despite 151 deaths of officers and men, the battalion managed to capture German trenches, the only unit to manage this feat on that day, though they soon were forced to withdraw. 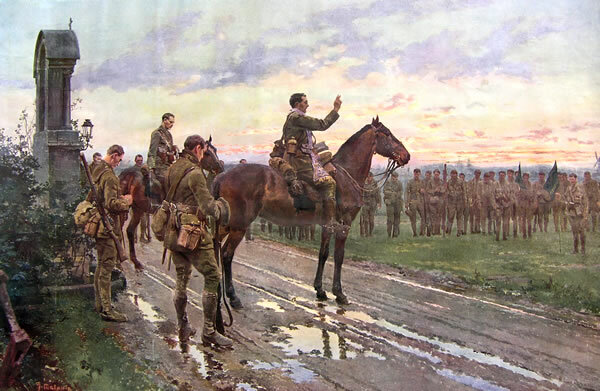 The day before the attack Rickard had halted his men at Rue Du Bois, before a roadside shrine (the altar of a war-shattered family chapel), in order to speak to them about the forthcoming battle; afterward the men received absolution from their pastor, the beloved Father Francis Gleeson, a moment commemorated in a famous painting commissioned by Jessie Moore Rickard, "The Last General Absolution of the Munsters at Rue du Bois," by Italian artist Fortunino Matania. Widowed and with a daughter and son to support, Louie Rickard, nearly forty years old, turned to her pen to make her way. 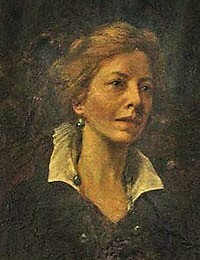 She had actually published two novels before the outbreak of the war: Young Mr. Gibbs (1912), a comedy, and Dregs (1914), described as a "psychological" novel. 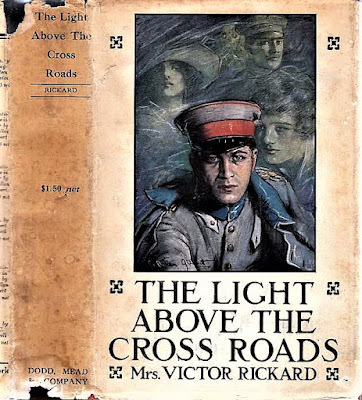 In 1915 she published The Story of the Munsters, about her husband's battalion, following it with a trio of popular and critically well-received war novels: The Light above the Crossroads (1916), The Fire of Green Boughs (1918) and The House of Courage (1919). She became a great friend of Hazel, Lady Lavery, an American-born artist and the second wife of celebrated Irish portraitist Sir John Lavery. Louie's novel A Fool's Errand (1921), introduced crime and adventure elements into her oeuvre, yet it was not until the mid-Twenties, with Upstairs (1925) and Not Sufficient Evidence (1926), the latter drawn from the real life Charles Bravo case, that Louie Rickard really made a splash in crime fiction. Other novels by her with definite criminous aspects are The Mystery of Vincent Dane (1929, The Baccarat Club in the US), The Dark Stranger (1930), The Empty Villa (1930) and Murder by Night (1936). Jessie Moore Rickard published at least 26 novels between 1912 and 1936, roughly one a year. After the publication of Murder by Night, however, Louie's production declined drastically. On the strength of her small output of crime fiction (excluding Murder by Night), which probably accounted for less than a fifth of her novels, Louie Rickard was invited to become a charter member of the Detection Club: a testament, surely, to the respect her fellow authors (or at least some of them) had for her reputation as a serious writer. 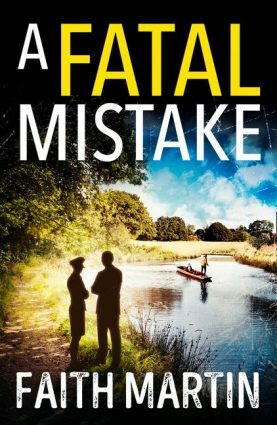 The crime novels by her that I have read are works more reminiscent of mature Ruth Rendell than, say, Agatha Christie; and I'll have more to say about them this month. As John Street's letter indicates, Louie Rickard seems to have had little, if anything, to do with the Detection Club in which she had accepted membership. Like other older Detection Club members in the 1940s, she suffered from increasing infirmity and in 1948 she returned to her native Ireland, settling in Cork. She died in 1963 and since then seems to have been almost entirely forgotten by posterity, except as a Great War lady novelist and as, as her official author name suggested, the wife of the fallen hero Victor Rickard. Mrs Rickard is buried in a single grave at Rathcooney Cemetery, north of Cork city. I have visited it a couple of times and also her husband's grave at Cabaret Rouge military cemetery in Belgium. Unlike her husband's grave, which is immaculately kept, her grave is sadly neglected although the headstone is of the finest quality. Yes, it would be nice to see her get some more attention for her work. Thanks for posting.